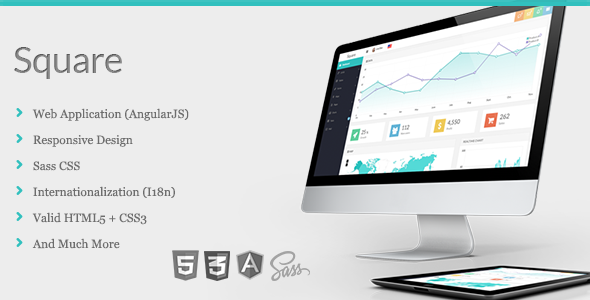 “Square” is a fully responsive admin web App built with AngularJS. It use Sass CSS which makes it easy to modify. Internationalization (i18n) and Localization (l10n) support. Add English, Español(Spanish), Japanese, Chinese, Germany, French, Italian, Portuguese, Russian, Korean for demo. Solid Workflow with Yeoman, scaffolding with Yo, dependencies (plugins) managment with Twitter Bower, tasks automation with Grunt, make all things organised. Item Reviewed: Square - Responsive Admin App with AngularJS 9 out of 10 based on 10 ratings. 9 user reviews.